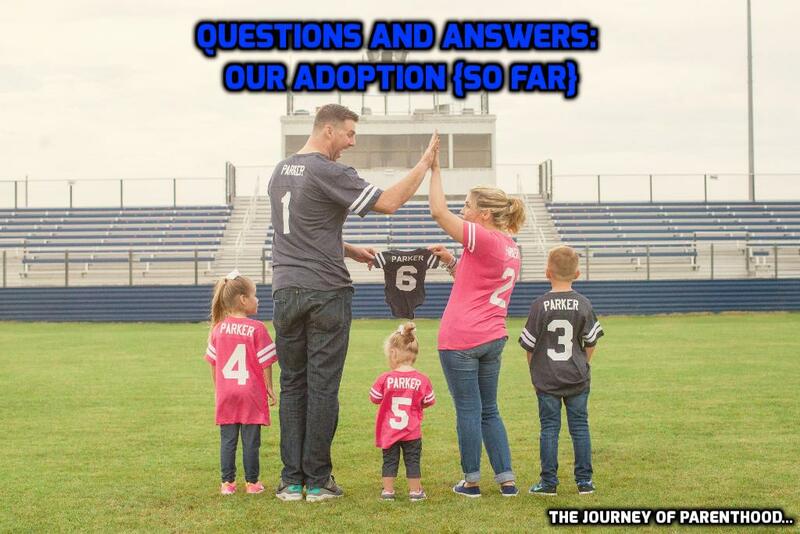 Does this adoption decision mean you are done having babies? Yes! We used to talk about having 4 bio children then possibly adopting. But once we started talking seriously about having #4 we realized 4 just feels complete for us (I mean hello once you have kid 5 life gets a little trickier…like how do they all fit in a van?) and we realized that if we had a 4th biological child that we may never adopt so we decided to go ahead and adopt as the way to complete our family. Our plans as of now are to have this baby be our last! Did you know having Tess that it was your last pregnancy? No! I fully planned at that point to go through the pregnancy experience again. But I’m GLAD I didn’t know it was my last time. I think if I’d known “this is it” that it would have been very difficult for me emotionally. I dealt with some postpartum depression after having Tess and I think that would have been much more intense if I knew she was my last pregnancy experience. I did truly embrace my pregnancy with her (as well as her labor, hospital stay, etc) and I realize now that maybe the reason I did enjoy it all so much was because God was already putting it on my heart that it was my last time! How do you feel about not getting pregnant again? I really have felt good about it overall! I didn’t get sad as I started to go through the girls’ baby clothes to sell (gotta help fund the adoption!) and knowing we’ll still be having another baby makes it easier. I also had SUCH an amazing birth experience with Tess that it was really the perfect note to end on! I did have a break down moment when Zach was in back pain and I offered for him to sleep with my pregnancy pillow to help his back. I got sad realizing I’ll never use that pillow again! I’m sure it’ll come in waves and like Zach said even if I went through pregnancy 10 times I’d still be sad about that phase of life coming to an end. Do you already know the child you are adopting? No! Most likely the child we will adopt isn’t even conceived yet. We are EXTREMELY early in the process. We are working through our home study now and may even take a “break” before looking to be matched. Ideally we’d prefer to wait for the addition of a newborn to our home until after May of 2017. Of course this is ALL God’s timing and not ours (whew, this process has already shown me how little we are in control of things!) so we will see where He leads us, but our preference is after May so we can enjoy our 10 year anniversary before beginning the newborn phase again! Originally we planned to wait to start the process until August (Tess will go to school a few mornings a week so I’d have TIME to work on things) but when we learned about how out of state adoption works we decided to go ahead and get started on things. Are you adopting a certain gender/race/health? Yes! With adoption it’s a faster process if you are willing to accept any gender, race, health etc. But for us we really want another son (Kye is SO PUMPED). We LOVE our girls, of course, but Zach always wished he had a brother growing up and we want our sons to experience that brotherly bond. If we’d had two boys naturally then we’d be adopting a girl b/c I always wished for a sister and want that bond for my girls as well! We also decided the we feel the best fit for us is a baby with a similar race to ours. We are SO blessed to have so much family surrounding us and I just want this baby to feel like he’s 100% a PARKER and I know that would be even more of a hurdle for him from a racial perspective. It’s also a lot about where we live. Transracial families are such a wonderful thing but it’s just not something you see often around here. I felt guilt about it for awhile there are a LOT of negative articles gears toward people who have adoption preferences. I’ve felt like I’m being selfish when SO many babies need forever families. However we know our family and I’ve talked to many people in the adoption realm that have made me feel a lot better about our decision! We have GREAT support systems and both our consultant and our case worker helped us see that it’s OK to be specific! It’s what is best for our family and (most importantly) our future child! When it comes to health we are still in a learning phase of that decision. We do not feel equip to have life altering conditions but right now are open to drug exposure or other genetic concerns. Like I told Zach…if someone was wanting to adopt one of our current babies they may turn them away due to genetic concerns (Mrs. Charlotte and Courtney both have serious auto immune diseases)! Family history doesn’t really overly concern me…I know personally that there is SO MUCH that the love of Jesus can take care of! Were you and Zach on the same page about completing your family? Zach and I have ALWAYS had the “big picture” things in common. Religion, where to live, number of kids, how to raise ’em. Everything. We really never struggle with big stuff b/c we ALWAYS agree and see eye to eye. God put adoption on my heart many years ago (can’t wait to share my story!) and it’s not something He initially put on Zach’s. Over the years he’s grown and changed and has had more of a ready heart for adoption. He was very surprised when I approached him about adopting baby #4 (and boy was I nervous to tell him) but he’s 100% on board and EXCITED for this journey! We both agreed that we felt like 4 children is “our number” and that we will be complete at that. I was more interested in adopting a toddler or older age child at first but Zach really wants to have that newborn experience one more time (he said “I don’t want to miss a single thing in this baby’s life!” SO SWEET) and we both agree on that as well! We also agree that keeping birth order is important so this baby will for sure be younger than Tess at the time we adopt! Why domestic adoption? Zach and I both believe strongly that our mission field is in our own backyard. We don’t feel called to do missionary trips (at least not at this phase in our walks) but feel more lead to do things on a more local level. When adoption was originally placed on my heart I actually felt like our child would come from Ukraine. But when the decision was made to adopt and I began researching things it’s just VERY hard to adopt internationally at this time due to so many places in war zones and other red tape issues. Zach and I agreed that we both feel most comfortable with domestic adoption and the opportunity we have to reach out to a family in need here! Why not through the state/foster care system? When we first were looking into adoption options this was the route I initially looked into. I love the idea of truly helping in our local community and I know there is SUCH a huge need for foster parents. But it’s actually very difficult to adopt through that situation. The goal of fostering IS to reunite the child with birth parents if it all possible. I think people who foster are truly called to do so and it’s a HUGE blessing. At this time, with the ages of our bio kids, it’s just not something that would be best for our family. I can’t personally imagine having to part ways with a child, but expecting my children to go through that difficult experience would be unfathomable right now. I have thought about possibly fostering someday when our children are older if the Lord puts it on our hearts at that time. The state process to adopt would be cheaper but it’s very much “you get what you get when you can get it” type thing and I prefer the hands on help through private adoption process. When I first spoke to an agency (who we didn’t end up using) I felt like THIS is our calling and our path! Did you know Tess would be the last child (most likely) that you are able to breastfeed? No I didn’t have a clue at that time. I’m truly so thankful for the AMAZING breastfeeding relationship she and I shared. It was the first time (out of three times!) that it all just clicked and went SO WELL (so well, in fact, that the child HATED bottles). I know after nursing three babies that no breastfeeding experience is alike. Each one is different and if I did have a 4th bio baby there is no guarantee that it’d go nearly as smoothly as hers did. Again, I’m sure this will come in waves but if I’m not able to nurse our last baby I do feel at peace about ending that experience with Tess! Much like my delivery experience, my nursing experience with her was a perfect end note! Open or Closed Adoption? This is another new area to me. All I’ve ever heard about is closed adoptions. Where the child never knows their birth family or anything about them or sometimes as an adult seeks to “find them.” That’s not really the case anymore and majority of adoptions are open on some level. We are open to any type of adoption depending on the specific situation. We feel the most comfortable with semi-open which is where we’d exchange letters and photos but not meet face to face. But I can see the blessings of open adoption as well (I’m in a group on Facebook with a lot of adoptive parents and they invite the birth family to birthday parties even!). So we will just see where God guides us on that situation! Right now we are remaining completely undecided on it and just going to let things fall where they fall. So much of it will depend on the relationship we form with the birth mother and her personal wishes and our level of comfort at that time. Of course the #1 concern is what is best for the baby! We will cross that bridge when the time comes! How are you feeling? Prior to Zach proposing to me, getting engaged was ALL I could think about. I was obsessed with being engaged and wanted it SO badly. Then he (finally) proposed and I freaked out. That’s very similar to how I’m feeling now. When we were first in the decision stages of adoption I was obsessive about it. Researching, thinking, talking (and talking and talking) about it non-stop. Once we made the final call about it though, Satan has been ON THE ATTACK (I plan to post more about this too as it’s SO much a part of the process). He has been putting fear in my path and giving me a general overwhelmed state (which I don’t do well with). He isn’t deterring me from our path though and, if anything, the constant flow of craziness he’s throwing at us is only reminding me JUST how called we are to DO IT! I told Zach that I feel like I’m going to vomit as I read over everything we have to do in order to adopt, but at the same time I’ve NEVER been so sure about something in my LIFE. On an episode of Nashville (random but stay with me) a kid decided to join the army. His dad asked if he was scared and the boy said “Of course I’m scared to death but I’m also so sure that this is the path for me.” 100% how I feel! God is calling us for this and we are stepping out in the faith, trusting Him and are excited to see where this will take us! It’s such a new experience and I’m truly pumped to learn about it all and especially to meet our precious son!!! In the monthly posts I plan to do I plan on asking for specific prayers related to what we have going on at that time in the process. To avoid my own overwhelmed feelings, I’m trying my best to take it a step at a time! Which y’all know is NOT easy for me by any means! There are a lot of unknowns in this entire process so I will be better equip to answer more questions as time goes on. I just would REALLY appreciate being lifted up in prayer! And right now it’s a great time to contact me if you, or someone you know, has gone through this journey. I’d love insight and suggestions!!! We are open to any agencies as well (Christian Adoption Consultants will help match us with agencies but we are also able to use any additional ones) so any recommendations are wonderful. Also any fundraising ideas and ideas for obtaining breastmilk will be much appreciated! Most of all though just please pray for us in this process and especially for our future birth mama and baby boy. I’m truly SO blessed by you all. You are my family. We have to have recommendation letters and I wish I could get a community letter from all of YOU. I always feel so much better about anything life throws at me when I blog about it. Your support, love, encouragement and prayers truly mean the WORLD to me! I know we shared our news very early-on but I couldn’t hide it from you guys any longer! I was more excited to blog about it than I was to tell a lot of “real life” people!!! Thank you thank you thank you!!! If you aren’t already following along with me on other social media outlets now is a great time! I post a lot on both Facebook and Instagram! My IG is private (creeper issues) so I do go through and typically request to follow anyone who asks to follow me so I can make sure everyone is a legit person 😉 I really am due for a big blog overhaul so if anyone has any suggestions on someone to help with that let me know (the person who did my last blog update is no longer doing it! ).